For renewable energy to make a significant contribution to economic development, job creation, reduced oil dependence, and lower greenhouse gas emissions, it will be essential to improve the efficiency of technologies, reduce their costs, and develop mature, self-sustaining industries to manufacture, install and maintain renewable energy systems. The goal must not be simply to install capacity, but to provide the conditions for creation of a sustained and profitable industry, which, in turn, will result in increased renewable energy capacity and generation, and will drive down costs. To achieve this end, a viable, clear and long-term government commitment is critical. Also essential are policies that create markets, and ensure a fair rate of return for investors. During the past decade, the world has witnessed double-digit growth in the wind and photovoltaic (PV) industries, significant advances in these technologies, and dramatic cost reductions. Today half a dozen countries represent roughly 80 percent of the world market for these technologies. Those countries have demonstrated that it is possible to create vibrant markets for renewable energy, and to do so very rapidly; but the record also shows that the renewable energy policies of most countries have been unsuccessful to date. Most of the renewable energy development experienced thus far has been driven by countries with feed-in, or pricing, systems. At the same time, a combination of policies is required, including standards, education, stakeholder involvement, and incentives to bring down the initial costs of investment and reduce risk, whether real or perceived. 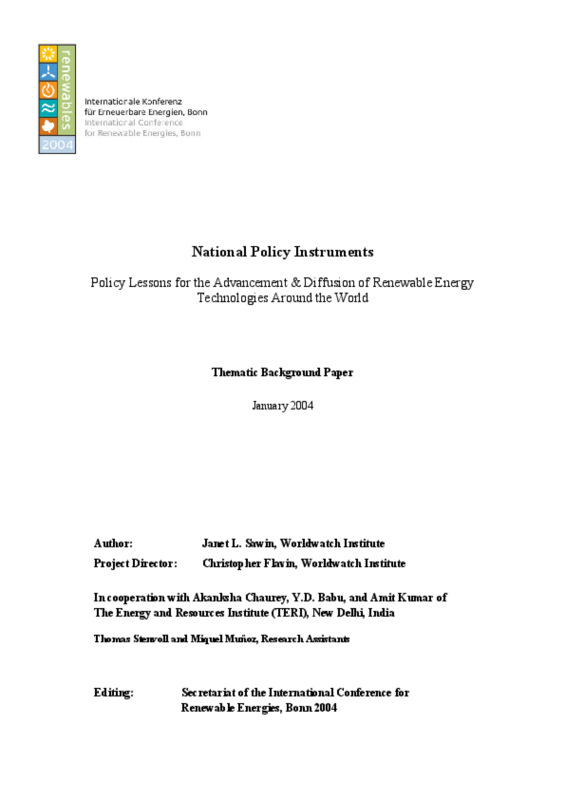 Ultimately, the effectiveness of policies in promoting renewable energy will depend on their design, enforcement, how well they address national circumstances, and the extent to which they are consistent and sustained. Copyright 2004 Worldwatch Institute. All rights reserved.